What are the qualities to look for when picking a co-founder? On the road to becoming a successful entrepreneur, knowing how to pick a partner for a startup is a must. A partner is an irreplaceable resource that has the potential to increase the quality of your decisions, your problem solving capacity, business acumen and design sophistication in all areas of your venture. A bad partner is not just none of the above, it is so much worse than that. The destructive potential of a bad partner cannot be overemphasized. She will pull the business in an opposite direction and create a zero-sum game; will devalue user/customer feedback, will be unappreciative of your effort, be a resistance in times that require change; won’t believe in the mission, will surround you and herself with toxic people and literally make it impossible to reach any of your milestones and succeed. In the best case, this type of partnership has a life-span equal to your patience. That’s why, knowing how to pick a partner is an A-level skill for startup success. Understanding how human behavior works is vital for that. If Startup Gods had granted me a choice between a good co-founder and a good business idea, I would chose the good co-founder in a heartbeat. Although pivoting from or morphing a once-too-precious idea can be psychologically painful, it is normal and sometimes even very healthy as proposed by Howard Lowe, in his book The Start-Up J Curve. Breaking up a partnership however is traumatic and is often accompanied by a serious deterioration of a once-dear friendship or acquaintance. So how on earth can you increase the chances of picking a good partner? 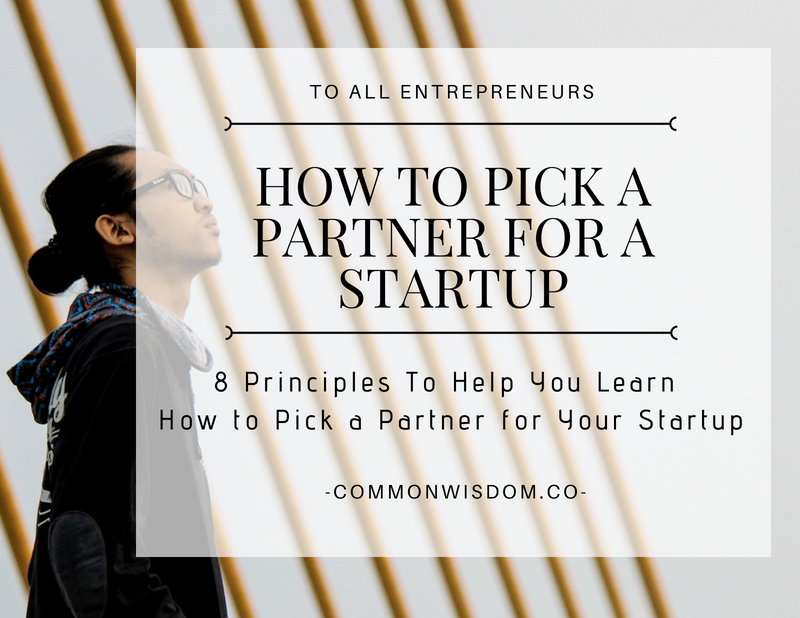 Here are the 8 qualities you should watch for if you want to learn how to pick a partner for a startup. Every startup, without exception, starts on a good note; with visions of grandeur, wealth or the dreams of making an impact. Again, without exception, there is a point in the life-cycle of every startup where the glitters of the first few days and months have faded and you are left with many problems that will take their toll on your energy and time. In those days, if a partner doesn’t have the necessary time, energy and financial resources to focus on dealing with the realities of the startup, she will back out. And that is the relatively good scenario. The worse one being a situation where a partner stops caring about and working for the project, while not accepting that fact to remain as a shareholder in the potential future success of the company. (Time for some anger management.) The key to understanding how to pick a partner for a startup is looking at the person as a whole. Passion is the result of caring deeply about a problem. It is not the end goal. Do not try to find your passion and love what you do; but try to find your problem, and love your problem. Enjoy the intensity of dedication and effort spent trying to solve that problem. All the better when you have a partner to try to solve the problem together.Sharing the problem with your partner is a must. Sharing the philosophy behind the problem (in other words sharing a unique world vision) is much better. A good partner should have sufficient depth-of-knowledge on at least one topic that is related to the startup. This depth-of-knowledge is vital because with that, the vision of the company will be more robust and the quality of decisions higher. Keep in mind the type of knowledge we are talking about is not necessarily only theoretical. Practical knowledge has a key role to play, too. Here is a litmus test. Ask your potential partner what she thinks has made the well-known startups successful. If the answer is among the realms of “a genius idea”, or “luck” take these as warning signs. When it comes to the potential success of your startup, a good partner places more importance on great execution, hard work, creativity, problem solving and self-discipline more than the ingenuity of initial ideas. A stroke of genius takes seconds. Planning and strategizing with a partner might take days. Actually building the startup takes many months, if not many years. So make sure good execution and work ethic are values which you and your partner agree upon. Being a startup founder is very similar to being an adventurer who goes out into the wild to survive alone with minimal resources. If you make the right decisions to survive, you are rewarded. You now get to see a great view of the world and experience the nature in a way only the lucky few can. However, if you make some bad decisions, it won’t be long before your fate turns sour. You will most likely perish. Great listeners are genuinely interested in what you have to say. They listen actively, meaning they do not only listen, but engage with you through secondary questions closely related to what you are telling. They are curious, they care, they are open to shifting their own perspectives on familiar issues. They believe, no matter how good theirs is, there is always the possibility of finding a better way. To be able to carry out its core function, a startup has to value good ideas, good questions, novel solutions and a collaborative spirit. The essential ingredient of all these and this collaborative spirit is a culture of listening. Listening is to collaboration; what a driving wheel is to an automobile. Startups or organizations which live in flux, discover new technological frontiers, innovate and wish to be the ‘change engines of the world’. They are in a different type of game. The carrot and stick approach fails here altogether. There are no external parties to define what the carrots and sticks are. It is also very difficult, if not impossible to set static standards for them while the business value proposition is in constant change, a pivot or business morph is unsurprising and the main motto is “on the road learning”. In such systems of flux, the new dynamics of motivation fit right in and shine bright. When those who do the work are the same people who draw out the business strategy and set the goals; they have to have autonomy, mastery and know their purpose. Pink defines the three pillars of motivation in the following way: Autonomy—the desire to direct our own lives. Mastery—the urge to get better and better at something that matters. Purpose—the yearning to do what we do in the service of something larger than ourselves. I would say the startup life is very good fit to practicing all three in a fulfilling way. While picking a partner avoid those who have not internalized the philosophy of being a life-long learner. They believe most learning is done at school. They tend to overemphasize the importance of their expertise in a field. They usually believe there is ‘one right way’ to do things. They are less open to doing a postmortem on problems or failed projects. Being a life-long learner means being open to new experiences and taking calculated risks. It means taking a moment to ask the question “What have I learned here?” in even the most difficult or sad moments in life. It means being obsessed with constant self-improvement and self-betterment. And most importantly, it means being curious and seeking the joy of finding things out. If you take these 8 qualities into consideration, you can consider yourself leveled-up on how to pick a partner for your startup. This blog post is a summary of the full list that was originally published in Startups Grow With People: How to Pick a Partner, How to Recruit the Top Talent and How to Build a Company Culture.